The lid of this small box is decorated with theva work, a type of work only undertaken by Raj Soni goldsmiths from Partabargh in Rajasthan. The technique involves incising and then cutting out small scenes and images from thin 24 carat gold. This is then fused onto glass behind which green and sometimes red foil is attached. The whole is then held in place by silver wire and mounted in gilded silver or gold mounts. Typically, theva wear shows village scenes or Hindu deities. The example here shows two peacocks amid foliage and flowers. The rest of the box comprises silver stamped with repeated floral motifs. 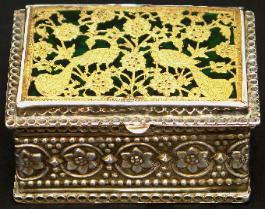 The interior of the box is in gilt.